OMAHA, Neb. 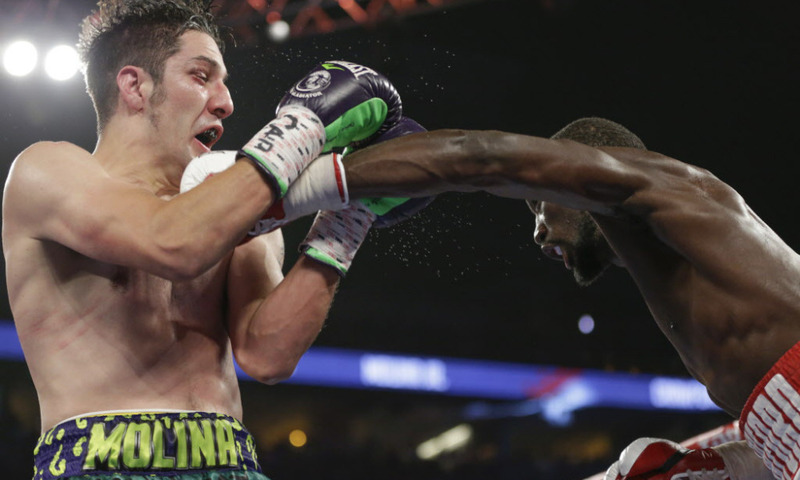 (AP) — Unbeaten world champion Terence "Bud" Crawford stopped John Molina in the eighth round to end a dominating performance and a dominating year. Crawford retained his WBO and WBC junior welterweight titles. Molina didn't make the 140-pound weight Friday, and had Crawford been upset, the titles would have been vacated. Backed by a hometown crowd of 11,270 at CenturyLink Center, Crawford was fighting for the third time this year and first since his lopsided win over former WBC champ Viktor Postol in Las Vegas last summer. In the fight before that, he knocked out Hank Lundy in New York. Now Crawford is poised to be named fighter of the year for a second time in three years. "I think I should get a lot of credit for what I did this year, especially tonight," Crawford said. "I showed I could be a finisher." Super lightweight champion Terence Crawford put on an exhibition of spectacular boxing and punching skills Saturday night in his hometown of Omaha, hitting his vastly overmatched opponent John Molina Jr. at will before finishing the challenger in the eighth round to retain his 140-pound belts. Crawford (30-0, 21 KOs), picked Molina apart round after round with precision punching in this mismatch, changing his stance from orthodox to southpaw and back again throughout the fight as has become his custom. Molina, meanwhile, chased Crawford around the ring looking for the home-run punch, a tactic he had used with success at times during his career, As a result, he left himself open constantly for Crawford’s lightning-quick combinations, while landing a haymaker every now and then. In the eighth round, Crawford decided it was time to end it and assaulted Molina in the corner, going to the head and body with a flurry, before referee Mark Nelson stepped in and stopped it at 2:32 of the round. OMAHA, Neb. -- Unbeaten world champion Terence "Bud" Crawford stopped John Molina in the eighth round to end a dominating performance Saturday night. Crawford retained his WBO and WBC junior welterweight titles. Molina didn't make the 140-pound weight Friday, and if Crawford had been upset, the titles would have been vacated. Crawford was in control all the way and finished off Molina moments after Molina raised his hands, as if to ask for more as the champion landed a flurry of punches. A shot to Molina's midsection backed him into the corner, and Crawford then unloaded repeated shots to the head and body, causing Molina to go down. Referee Mark Nelson stepped in to stop the fight at the 2:32 mark.